Two sculptures on view in NMWA’s third-floor galleries have much in common despite strong visual differences. Eridanus (1984) by Lynda Benglis is a large metal work that appears twisted and hung like a piece of fabric. Honor Freeman’s Tupperware—Transforming a Chaotic Kitchen (2008) is a set of realistic porcelain replicas of early Tupperware products. Both sculptures highlight conflicts between material, appearance, and subject to create meaning. Benglis’s use of metal evokes Minimalist sculpture, a genre strongly associated with male artists. The hardness and heaviness of metal contrasts with the work’s soft, fabric-like appearance. 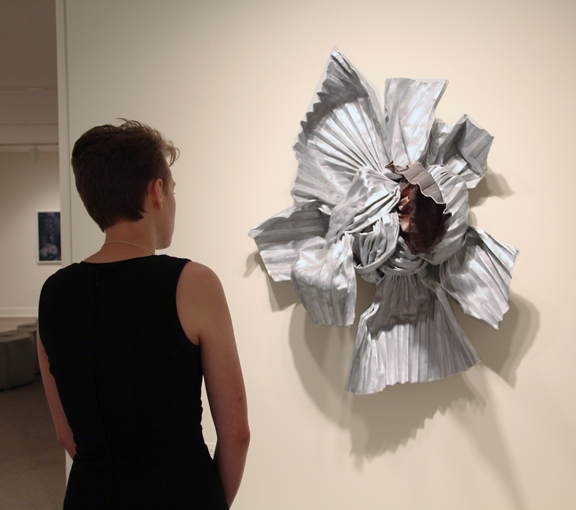 By manipulating metal to look like fabric, the artist combats the frequent stereotyping of female artists’ work as soft, feminine, and delicate—whereas even similar work by men is viewed differently. Freeman’s work also juxtaposes material and appearance. 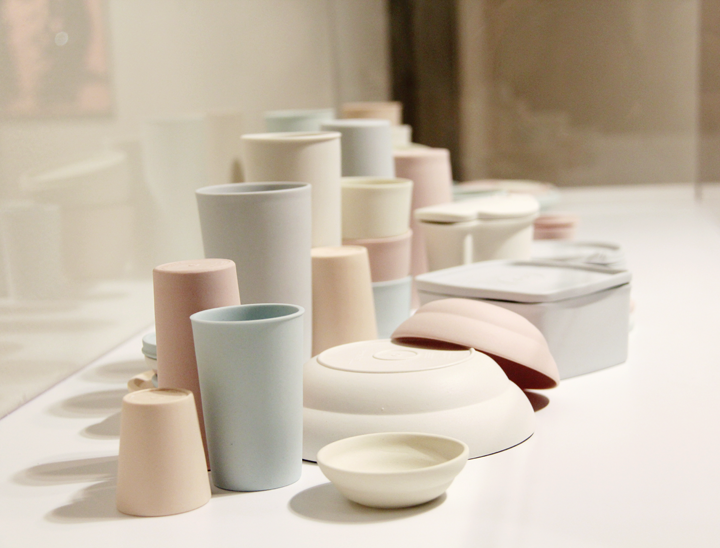 The use of porcelain, a fine art material, to create 59 representations of common household Tupperware plays with traditional distinctions between gender, quality, and craft. The elevation of Tupperware to display-worthy status mirrors the elevation of ceramics and other craft works to the status of fine art. These works also share themes of artifice and beautification. In Eridanus, the illusion of shimmering silver fabric is disrupted by one rust-colored piece of metal that juts out instead of hanging gracefully. This disruption draws attention to both the material and the artifice of the rest of sculpture, which is styled to look soft and pretty. Described by the artist as a “ghost” or “memory of a past form,” Tupperware—Transforming a Chaotic Kitchen creates a sense of nostalgia for a domestic ideal of past eras. However, the knowledge that this is a reconstruction in porcelain rather than the authentic plastic containers reminds viewers that they are not seeing—or remembering—things exactly as they are. This frames the idealized version of the past as a false memory, a beautification of historical reality. Both sculptures deal with the social status of women as artists and workers. By drawing parallels with a celebrated but male-dominated art movement, Eridanus reminds viewers that women artists face professional inequities. The sculpture references issues of gender, interpretation, and sexism that significantly impact the careers of female artists. Freeman’s sculpture deals with the shifting status of women more broadly. Historically, selling Tupperware gave women new opportunities. The choice of this subject highlights the tension between nostalgia for the “better days” of the past and the less-than-ideal historical reality of many women’s lives. The elevation of domestic objects and “craft” techniques to the status of fine art may also celebrate the many economic and social advances women have made in recent history. Visit NMWA to see Eridanus and Tupperware—Transforming a Chaotic Kitchen together in one third-floor gallery.